Welcome to our first installment of AeroMail. Since AeroGeeks’ launch, we have been corresponding regularly with our readers to find answers to their questions and respond to their feedback. We’ve realized that these Q&As can provide additional value to all of our readers, so why keep them to ourselves? With that said, we’re happy to present the very first edition of AeroMail featuring a reader question on tire size. Read on to see how Paul Lew of Reynolds responds. I’m trying to figure out the aero characteristics of various tire sizes on a toroidal wheel (firecrest 404). How do 20mm, 21, 22… 25 tires compare at various yaw angles on a toroidal wheel like the firecrest? I’ve spent the last hour searching the internet but no one seems to have any data. We actually reached out to Paul Lew from Reynolds regarding this. We went to Reynolds since unlike many of the other wheel brands, Reynolds is not producing their own tires which we felt gave us the best chance for an unbiased opinion. The tradeoff being that his answer is more specific to wider wheels than specific toroidal shapes. Generally, the narrower the tire, the better the performance. As an example a 25 mm wide rim will perform best with approximately a 14 mm tire… that’s right I said 14 mm. The main reason rims are wider is because the wide rim trend is in response to wider tires. If you look at aerodynamic data from 1980, the overall wheel drag has not changed much. In the 1980s TT tires were 17 or 18 mm and rims were 18 – 21 mm wide. Today TT tires range from 21 – 25 mm wide, and rims are 23 – 26 mm wide. In the late 1990s and early 2000s low drag design peaked with innovation at a very high level. Then, UCI made the ruling that banned innovative designs like boom bikes, Lotus, and USA Cycling super bikes. Then, the wider tire trend started. Combining the traditional bike design requirement and wider tires, aerodynamic drag increased. This opened the door for wheel designers to innovate (create wider rims) to respond to the wide tire trend. If you look at an efficient airfoil design you notice that the leading edge diameter is significantly smaller than the rim width. I did a quick Google search for “low drag airfoils” and this link was one of the first to pop up; there are thousands of links under that topic. This one was nothing special, just an example of the relationship between leading edge and maximum width. Our clincher rims were designed for 23-25 mm tires. The problem with most wide clinchers is you can’t mount a tire with a diameter smaller than 23 mm and have good retention. 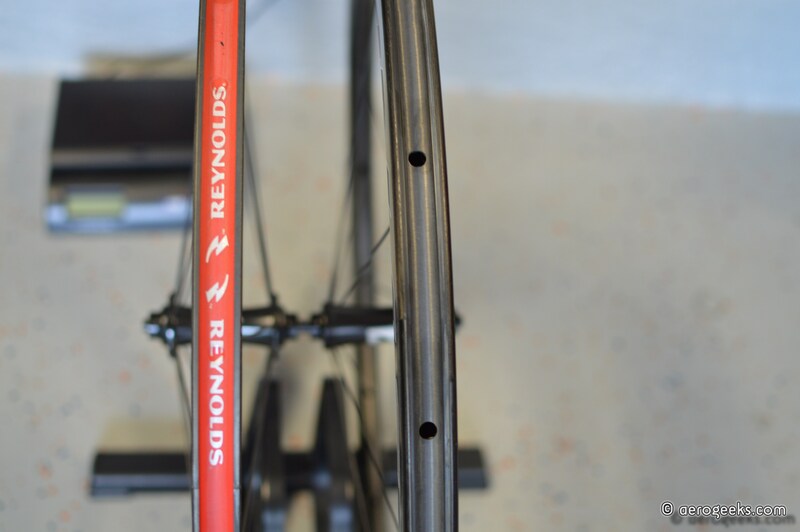 You can (for best aerodynamics) race a 21 mm tire on our tubular rims. It’s interesting when you consider the historical perspective. I hope this helps. Regarding data… I have data from my wind tunnel testing in the mid 1980’s, but I’d have to dig it out. Bryan, thanks for reaching out with your question. To all of our readers, you can always contact us anytime via our Contact Page, Facebook or Twitter. . As always, thanks for reading and best of luck in your upcoming races! So the industry is making wider rims to respond to the cyclist’s trend to use wider tires (which are supposed to have better rolling resistance and smoother ride). So that means I do not have to go and sell my 21cm wide carbon tubular race wheels with 19cm (front) and 21cm (rear) tires if we are considering Aerodynamics only? From an aerodynamics point of view (specific only to tire size) – correct. However that does leave the question of the aerodynamics of the hoop, spokes, and the rolling resistance of the tire.